San Diego Comic-Con is a busy every year for us. Between Paul prepping for Cool Jerk for the convention and me balancing work, the thing I look forward to the most is catching up with friends. If you’ve ever been an exhibitor at any convention, it’s really hard to get away from the table and see people for any extended amount of time. In addition to that, I just wasn’t feeling myself this year and instead threw a comic-con party with a few friends and exhibitors after the convention had closed on Sunday. 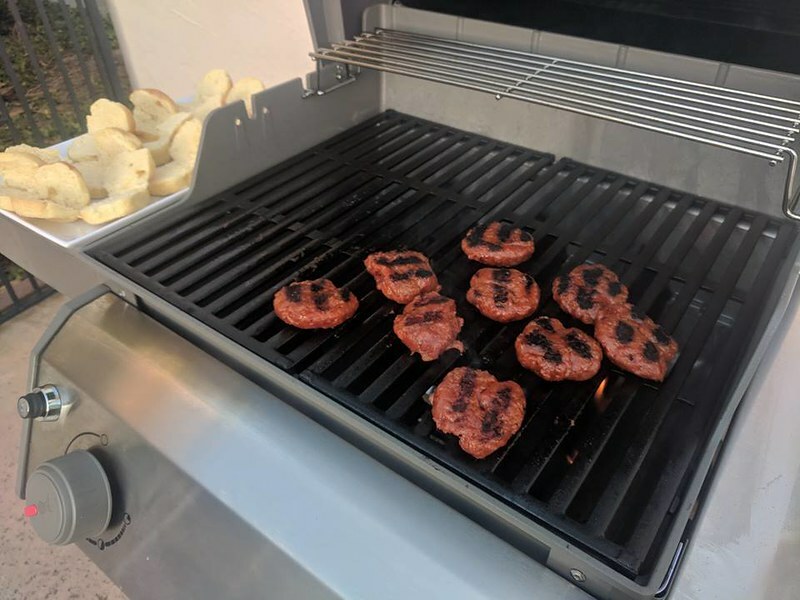 I had just bought myself a fancy new grill for my birthday (it’s blue!) and wanted to feature Filipino food. 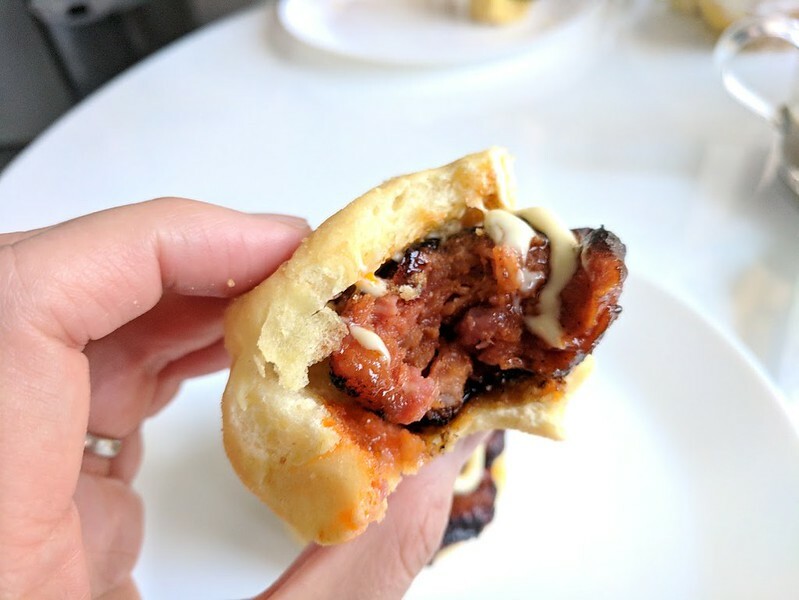 Chef A.C. Boral served up some amazing longanisa sliders a few months ago at a Faye Rodriguez’s house and I knew it had to be one of the many things including lumpia, pancit, chicken skewers, leche flan and calamansi-lemonade with Filipino gin. And banana sauce – can’t forget that! For the uninitiated, longanisa is a Filipino sweet sausage that pairs deliciously with the already sweet pan de sal. You can find longanisa in the refrigerated aisle with other other sausages. (Magnolia is a popular brand.) Since I was going to use them as sliders, I wanted them without the casing and made the longanisa myself. It was so easy! Beet root powder gave the longanisa the familiar red hue to the meat and I added more pork fat to give it some extra juiciness. Aside from getting a bag of mini pan de sal and adding a squirt of Kewpie mayo, a Japanese mayo made with rice vinegar, on top and that’s it! Add all ingredients in bowl and mix with hands making sure to incorporate everything. Form into small oblong patties. 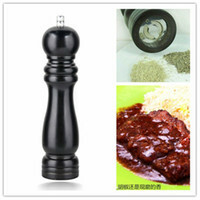 Cook on grill or stove top making sure internal temperature reaches 160 degrees. Serve on fresh pan de sal with Kewpie mayo if desired. so lovely of you to invite me and so sorry i couldn’t make it. now…please to tell me more about this Filipino gin. I’ll try to aim to do it again next year with enough notice for you. I have no idea where to start with gin! Love it in citrus drinks!! !